Meet Triangle. He is going to play a sneaky trick on his friend, Square. 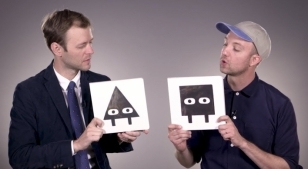 Or so Triangle thinks. . . . With this first tale in a new trilogy, partners in crime Mac Barnett and Jon Klassen upend the traditional concept book and approach it from a new angle. Visually stunning and full of wry humor, here is a perfectly-paced treat that could come only from the minds of two of today’s most irreverent — and talented — picture book creators.